Hatters boss Nathan Jones has kept it business as usual this week despite Luton, like the rest of England, being in the grips of the ‘Beast from the East’. Plummeting temperatures and snow would have no doubt seen training disrupted had Town still been at their Ely Way premises, but not so at the Brache with Jones able to put his players through their paces ahead of Saturday’s trip to Cambridge United. I imagine there will be a lot of games this weekend beaten by the elements, but all we can do is hope and pray. He said: “We’ve had to improvise a little bit, but we’ve had a full weeks training. “Monday we were able to train, Tuesday we had the covers on, so we pulled them off and had a full days training, and today, we’ve got a wonderful facility here so we’ve had to train on 4G. “But it’s given us a good surface to train on and is far better than I expected having looked at the weather forecast and the temperatures and driving in. Although at the moment the match with the U’s is still on, with no sign of the weather improving by the weekend, it remains very much in the balance whether the game will actually go ahead. Jones said: “I think it’s probably 50/50, Cambridge are probably the same as us, they want it on, they’re trying everything they can. 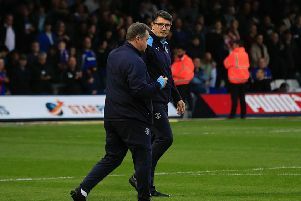 “It’s a good pitch over there, they’ve covered the pitch, I know the groundsmen are very good, Luke Berry gives them a glowing reference for their groundsmen, so they’ll try everything they can. “If they’re beaten by the elements then there’s nothing we can do. “I imagine there will be a lot of games this weekend beaten by the elements, but all we can do is hope and pray. Despite the obvious doubts, Jones has made sure his players are gearing up for the game to be given the green light, as he added: “Of course, because you can’t second guess it in any way. “We’ve prepared, had a normal week, a good lead-in, I would imagine most teams are doing exactly the same. With 12 matches to go, Luton only have one midweek fixture left, a trip to Coventry on March 13, and Jones is keeping his fingers crossed that remains the case, as he added: “I hope we can get the game on as we don’t want another rearranged. “We don’t want to fall behind on games and have to play a significant amount, as some are playing midweek now. “What we don’t want is a backlog of games, we want to keep up with everyone. “I envisage there will be a lot called off this weekend, outside the Championship, it will be very difficult. “I know covers are on, but temperatures have fallen to minus seven, covers don’t do it then.